After a high-flying first year, Supergirl comes back for its second season. This four-disc set covers all of Season Two’s 22 episodes. The plot synopses come from IMDB. Season Two opens with a bang, as “Adventures” reignites the characters well. It mixes action and character development well and manages to balance a mix of narrative threads. Add in a the fun guest spot from Superman – and the introduction of a role familiar to fans of the Christopher Reeve movies – and “Adventures” soars. After a strong season opener, “Children” seems a little lackluster. While it gives us a decent amount of good material, it doesn’t move the narrative along as well as I’d hoped. Still, it’s a largely positive program, and I suspect S2 will bounce back quickly. S1 brought Helen Slater - Supergirl in the 1984 movie - and S2 gives us 1970s TV’s Wonder Woman with Lynda Carter. Gimmicky as that casting might be, it works, and the rest of “Earth” adds intrigue to the season. This offers a solid show with good new elements. Does “Survivors” exist as much more than an excuse for wild alien-on-alien battles? Not really, but with results this entertaining, I don’t care. The episode moves along plot points as well and becomes a solid show. If you think S2’s “legal aliens” theme exists to echo modern politics, you’re right. That’s not the most clever take on matters, but it does give the year a little depth. “Livewire” moves along events in a compelling manner. With “Changing”, we get a soap opera-style show. Though it throws out some of the usual actual, it focuses on melodramatic character elements too much of the time, factors that make it subpar. “Place” offers a fairly good mix of plot and action. It starts on a high note and manages to keep up the pace well, and those parts turn it into a satisfying show. While I do like S2, I could live without all the soap opera elements – from Alex’s emergence as gay to the Kara/Mon-El vibe to other bits, the year lays on the melodrama too thick. “Medusa” manages to advance narrative components well enough but some of the character stuff makes it drag at times. By the way, the appearance of Barry and Cisco exists solely to tease a crossover episode of The Flash, so don’t expect them to do anything here. Kevin Smith guest-directs “Lives”, but don’t expect any stylistic differences, as the episode feels identical to its siblings. Still, it’s an above-average show, as it offers a fun exploration of a situation in which Supergirl’s powers don’t work. As a superhero, Supergirl seems surprisingly low on archenemies, so Livewire makes a welcome return here. “Heroes” keeps melodrama to a minimum and becomes a strong episode. I must admit I never was wild about the J’onn character, and his development during S2 doesn’t change my mind. Add to that a sequence that blatantly steals from The Thing and this turns into a lackluster show. I never took to S2’s “Cadmus” subplot and hoped it ended a few episodes back, but it returns here. I’m still not enchanted by that theme, but “Luthors” adds enough intrigue to the proceedings to work. Other characters got “makeovers” for Supergirl, with James Olsen the biggest change of the bunch, but the TV Mxyzptlk offers an enormous visual change from his comic book version. That Mxyzptlk was a tiny, oddly-outfitted elf with a bowler hat, not the smooth, handsome GQ model we get here. Surprisingly, the shift works, partly because Gadiot pulls off the part well. He looks a lot more attractive than the comic Mxyzptlk, but he brings a fun sense of unpredictability and lunacy to the role. All of this leads to a lively, enjoyable show. Just when I think Cadmus is out, they pull it back in! The return of Kara’s father offers some intrigue, and it allows Mon-El a rare chance to be a meaningful character and not just a goof. I still wish S2 could move past Cadmus, but “Homecoming” fares well anyway. While I like Benoist’s take on Supergirl for the most part, I don’t think she differentiates Kara and Supergirl well. Both show the same public personality much of the time, a factor that makes it more difficult to believe no one figures out they’re the same person. As the synopsis implies, “Exodus” focuses heavily on Cadmus, which leaves me semi-cold. The continued mystery about Jeremiah evokes some intrigue but this doesn’t develop into a great show. At the start of S2, I didn’t expect much from the Mon-El character, but he managed to develop into a fairly interesting role. I’m also happy that “Star-Crossed” manages to incorporate another alum from a Super-show, as Teri Hatcher plays Mon-El’s mother. Even with the eye-rolling comment about a desire to “make Daxam great again”, this still turns into a solid episode. The Music Meister segment adds little, though – in another annoying twist, that part just teases an episode of Flash. One major annoyance of the Flash crossover: it leaves lapses for viewers of Supergirl. “Star-Crossed” ended with Kara/Mon-El on the outs, but “Sun” has them together with no explanation. If the Supergirl wants to do these crossovers, they should include those other series’ episodes in this set as well. Other than that irritation, “Sun” offers a pretty good show. It deepens the Mon-El elements and throws out enough action to make it a worthwhile program. Like Mon-El, Lena offers one of S2’s more intriguing characters, mainly because her allegiances remain up for grabs. Is she good, bad or something else? We still don’t know, and that adds suspense to the season. “Reporter” doesn’t develop these elements as well as I’d like, though. Sure, the use of Lena’s ex Jack seems like a promising development, but the “nanobots” feels trite. That means this becomes a mediocre episode. Alex: “When Alex is kidnapped, Supergirl and Maggie must work together to save her. The kidnapping plot doesn’t offer much originality, and the rest of “Alex” follows suit. The episode’s main villain seems dull and he becomes part of a lackluster show. The connection between Lena and Rhea adds some intrigue, though. Normally a series like this would amp up the action toward a big climax, and maybe that’ll happen here. However, S2 lacks a clear overall arc – while elements like Cadmus and Mon-El create overriding themes, they don’t give us one consistent storyline to conclude at season’s end. Even without that, “City” musters good entertainment value. It pushes along various character and story elements in a satisfying manner that leads us ahead well. My prior comments about the absence of a climax connected to a season-long arc remain correct, but that doesn’t mean S2 lacks a big finale. “Resist” comes with a massive alien invasion, so it packs more action than the usual episode. It also brings the welcome return of Cat, one of the series’ best characters. I’ve missed her this year so it’s good to see her again. All of these factors converge to make “Resist” a strong episode that leads toward the year’s end well. Season Two comes to an explosive end with this exciting show. It opens with a Supes on Supes fight and progresses through other action spectaculars, all of which allow “Persisted” to finish the year on a positive note – and with a cool teaser for Season Three. Overall, S2 works well. Yeah, I think some of the “soap opera” elements get tedious, and I’d like to see more super-villains to battle our lead, but the year still manages a lot of action and excitement. Supergirl remains a fun, compelling superhero series. Supergirl appears in an aspect ratio of approximately 1.78:1 on this Blu-Ray Disc. As expected, the shows offered solid visuals. Sharpness worked well. A few interiors could be a smidgen soft, but those instances remained rare, so the majority of the episodes delivered tight, concise material. I saw no signs of jaggies or moiré effects, and the shows lacked edge haloes and source flaws. To the surprise of no one, Supergirl went with a typical orange and teal palette. These colors seemed tedious, but the episodes displayed them in an appropriate manner. Blacks appeared dark and dense, and shadows showed nice opacity. The episodes came across as appealing. In addition, the DTS-HD MA 5.1 audio of Supergirl also satisfied. With plenty of action on display, the soundscapes boasted a nice array of information from all five channels, and the information moved well. This left us with broad, immersive soundfields. They used the different speakers to create a good sense of the fights and mayhem – the TV series’ budget meant the audio wasn’t quite feature film quality, but it still seemed very good. Speech came across as natural and concise, while music showed rich, full tones. Effects appeared accurate and dynamic, with good low-end and impact. I felt pleased with the soundtracks found here. On Disc One, we get a featurette called Alien Fight Night. 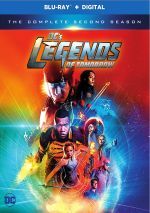 It runs 10 minutes, six seconds and involves executive producer Andrew Kreisberg and writers Paula Yoo and Eric Carrasco. They discuss aspects of the “Survivors” episode, but don’t expect much depth. While we get a few good insights, the overall impression remains superficial. 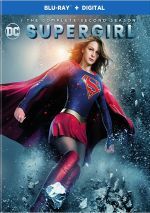 Disc Two brings an audio commentary for “Supergirl Lives”. Here we hear from Kreisberg and director Kevin Smith for a discussion of series domains and episode specifics. Too much of the commentary devolves into a mutual admiration society, so expect a fair amount of praise. Still, the track remains lively and fun, and Smith helps move it along at a good pace. We get enough useful details to overcome all the happy talk. “Among” examines aliens in pop culture as well as their use in Supergirl. This becomes a decent look at the subject matter, though it skirts around the ways the series reflects the current political atmosphere, which feels like a cop-out – if you’re going to allude to Trump during the episodes, bring it up in the featurette. A 2016 Comic-Con Panel lasts 28-minutes, 26-seconds. In it, we hear from executive producer Sarah Schaecter and actors David Harewood, Chyler Leigh, Melissa Benoist, Mehcad Brooks, Jeremy Jordan and Tyler Hoechlin. As usual, the panel exists to promote the season, so the participants tend to speak in vague terms about characters and story elements. We get a little more detail than usual but don’t expect much substance. Did You Know? splits into seven short clips with a total running time of five minutes, 45 seconds. Across these, we hear from Kreisberg, Harewood, Benoist, Brooks and Leigh. These offer little trivia bits that offer a moderate amount of entertainment. Finally, we get A Conversation with Andrew Kreisberg and Kevin Smith. In their three-minute, 55-second chat, they tell us a little about Smith’s participation in the DC TV universe. It’s a brief but good snapshot. After a successful opening year, Season Two of Supergirl continues the fun. It maintains a good sense of action and overall narrative intrigue to create an enjoyable collection of shows. The Blu-rays presents very good picture and audio as well as a handful of bonus materials. Fans will be happy with this package.